One of the most common and most frustrating toilet tank problems is the slow leaking of tank water through the flush valve, into the toilet. As the water leaks, the tank water level falls, and the toilet ballcock fills it back up again. It's a wasteful and annoying problem. One of the neatest products we've found is a sub $10 repair kit made by Fluidmaster called the Fluidmaster "Flusher Fixer" Model 555C. 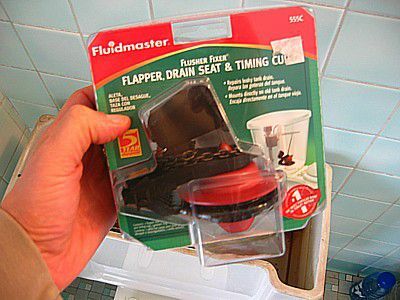 It allows you to repair the flush valve with a fool-proof valve kit that anyone can install. 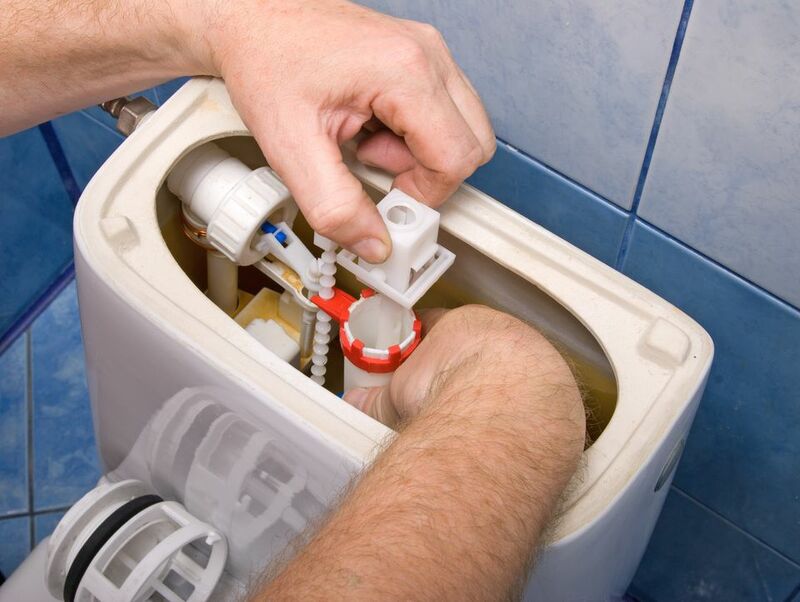 The first step in the toilet repair is to turn off the water supply to the tank. If you do not have a localized shut off valve, you need to shut off the water supply at the water meter. Once the water supply is turned off, flush the toilet to drain the tank of most of the water. Remove the old tank ball or flapper ball along with any guide wires or flush lever chain. You want nothing left of the drain valve assembly. You want just the drain valve seat to be exposed. Be careful not to drop anything into the drain valve opening, or you could cause a clog. Once the tank is drained and the old valve ball is removed, there will still be water left in the very bottom of the tank between the tank bottom and the top of the flush valve seat. This water needs to be removed, and the easiest way to do this is to use a sponge. Sop up the water, squeeze it out into the sink and repeat until the tank is fully drained. If the old drain valve seat is brass (most are), it needs to be cleaned. The easiest way is to use steel wool or fine sandpaper and clean the seat of any residual debris. Rinse it off with a soft cloth and then dry it fully with a towel or hair dryer. If you use a hair dryer be sure not to heat just one spot for a long time. The slickest part of this retrofit system by Fluidmaster is the sealant ring they provide. Just peel the paper from one side, then carefully center it over the opening of the cleaned valve seat. Press lightly to set it in place. Do not press too hard! In this picture, you can see the ridges under the flapper ball valve seat that will be pressed into the sealant putty. This will create a strong, watertight seal. Before you remove the paper on the sealant ring, test fit the best location of the flapper ball valve assembly. Try to position at about a 45° angle so that the tank ball can freely pivot and open fully when lifted by the chain. The chain should pull straight up or angled slightly back toward the hinge of the tank ball. Once you have the proper location, remove the paper from the sealant ring. Place the flapper ball valve assembly over the sealant ring in the proper position and press down firmly to seat the bottom into the sealant ring. Make sure the tank ball is closed. Make sure the toilet flush lever is down. Connect the chain attachment clip to the hole in the flush lever. Connect the clip to the proper plastic chain link so as to provide a slight slack in the chain. Trim unneeded chain links leaving a few extra hanging from the attachment clip. All that's left is to turn the water supply back on, let the tank fill up and check the flush operation. If you need to adjust the chain length to achieve proper operation, do it now. Once the flapper ball lifts and the fill cup tilts back to fill with water, the valve is operating properly. You're done! This problem won't bother you again for a while, and you just saved over $100 in repair bills.